That must be YR17, then. Haven't had a chance to listen, yet. - and here's an example of some prototype Insanity Cards. Two sets of ten following the general descriptions for the short-term and longer-term Temporary Insanities. "Pick a card, any card..."
Obviously you could expand these to much larger decks with specific insanities and nice custom art. Maybe FFG could do a set? How have you been attaching the copies to the cards? When I've tried this in the past using labels or stickers, I've ended up with extra-thick "chunky" feeling cards. Simply using cheap photocopy/printer paper and a glue stick. The cards don't seem particularly chunky. The paper's thin enough to use, but thick enough to completely obscure the original card art. I'm always worried about warping, so I tend to stick with the much messier and more annoying Rubber Cement method. Hows the glue stick working out? Any pealing or warping issues? 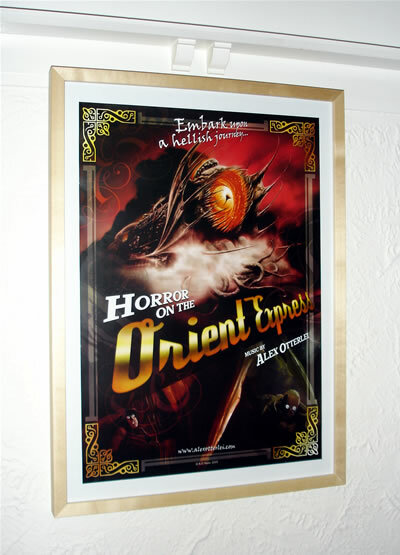 For a bit of inspiration during the game, one of the Horror on the Orient Express soundtrack posters on the wall of the gaming room. Thats a really nice looking poster! I need to work on making one of those "gaming rooms" myself. I'm looking forward to this set of game audio. Especially since I'm starting to run out of good podcasts again. Still more to follow and some audio processing later. Aw, cool. Is that a subtle application fo the old the old Alien Skin "plastic wrap" filter, for preternatural sliminess? You're really going all out on the cool extras, with this one. Anyway, I just finished World's Largest Dungeon--that was a remarkably satisfying ending, there--and now I'm really dying for HotOE. I may have to become a media patron, just to manage the addiction until it's available (not to mention the terrible time between chapters!). Oh, by the way: Nice American accent in Sandy's Iraq game, Paul! Thank you for the kind comments on my accent, I don't know what happened, I have a reputation for terrible accents to uphold! As an aside while attempting the generously termed 'accent' I was envisaging Jean Reno in the modern Godzilla movie doing an Elvis impersonation in the truck. Doing a bad impersonation of a bad impersonation makes a good one? The secrets laid bare! Some initial audio for you. It's a part-reading of the introduction from Book I (Campaign Book) of the game. Hopefully it will give some extra context with regards to the Orient Express. Very very neat. And, y'know what - I can't imagine many Keepers not feeling the urge to immediately go work on some prep of their own after listening to this excellent intro. Okay, that is it. I'm in. PayPal engaged! Hey, so is Helen's magician's assistant the same disfigured midget from Lindsay's short-lived game? I'm curious as to the name change of the dummyhead. First it was referred to as The Brazen Head then Howard for Dead Man Stomp and in Yog Radio. Now I noticed you've called it Phillips. Are you changing the name each time you improve the setup? I wonder if you can get a lifesize bust of HPL... Now that would make a interesting centre piece! 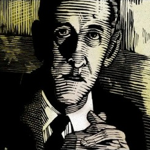 How about a lifesize, completely realistic mannequin of HP Lovecraft and oooh how spooky it is... .and did its finger just move....? *It is a word. Just like photographisation! But the real question is how she manages to become a dwarf, later on. Didn't the original Violet Davenport have an amazingly tiny size score, all the better to be hidden in magicians' cabinets and such? Oh, poor Miss Davenport. If she somehow survives this train ride, all she has to look forward to is disfigurement and--if I remember correctly--widowdom, as well. That, and getting to see a very weird play staged by a Texan man who talks like a valley girl. haha! The valley girl texan man was pretty funny. I'd like the link to these.